Make this plastic canvas purse for girls with these great patterns and instructions. Bonus: The Easy Print Version contains all 6 purse cover patterns in additional to all purse instructions. Take two of the corner pieces that you cut off the sides and turn them so together they form a large triangle where the rough edges are facing out, left and right. Cut the new large triangle out of the additional piece of canvas. (see figure 3) Repeat to create a second larger triangle piece. Stitch all the pieces for the purse body, except for the top flap piece. The bottom of the purse should follow the up and down pattern used across the front and back. 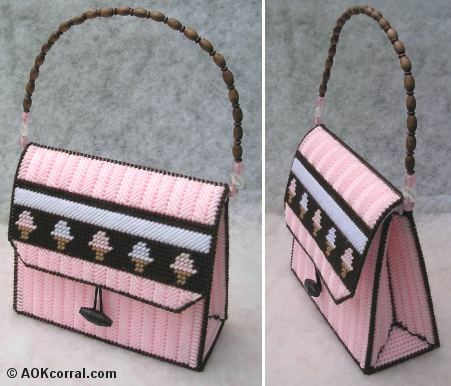 Click Here for Purse Body Patterns. Cut canvas for the top flap and stitch according to pattern directions. Click Here for Purse Top Flap Pattern. Finish the front edges of the purse top flap. (You will finish all edges except the edge that will connect with the back, the hinge edge.) Begin by securing your yarn near one of side top corners, then loop through each hole and over the outside edge all around the flap to the other top corner. Secure the yarn end. Lay the top flap onto a piece of the felt. Cut the felt to be just inside the edges around the top flap, and leaving 1 ½ inches of extra felt beyond the purse hinge edge. Set the lining aside. Thread your yarn needle and large needle to begin joining the pieces. As you begin, secure the end of the yarn by sliding it under several stitches on the back of one of your pieces and near the corner you wish to begin at. First, join the shorter lengths of the sidepieces together. When you reach the end of the sidepieces, take the triangle piece and join it along the bottom of each sidepiece. (see figure 5) Check often to see that when you finish, the corner edges of both sidepieces and triangle line up as if they were one piece. Next, join the back piece to the bottom piece and then the front piece to the bottom piece. Now, join one of the completed sides onto the purse. Start your stitching at the top front and work around until you reach the top back. (Remember that the back piece has 4 additional squares in height so do not be alarmed when the back side does not meet up with the back piece. Join the other completed sidepiece onto the purse from top front, around to top back. Join the top flap to the purse along the hinge edge by matching up the squares and looping your needle and yarn through each pair as you did when assembling the purse body. Secure the end. Find the center of the top flap piece. Using a needle and thread, attach the hair band to the wrong side of the top flap approximately 1 inch from the bottom edge. In order for your stitches to remain invisible on the right side of the top flap, you will want to use a color of thread that matches the pattern color at the location you are attaching the hair band. The easiest way to attach it is to send your needle and thread through from the wrong side and leave 2 to 3 inches of the end of thread on the wrong side, then send your needle back through from the right side, in a different square. Place the hair band between the two ends on the wrong side and tie the ends of thread together in several knots. To strengthen, repeat a few more times. Hint: Be sure to do your stitch between the rows of ups and downs on the pattern so it will not be easily seen from the right side. Locate the position for the button on the front of the purse by closing the purse top flap and pulling the hair band down enough to create some tension. Notice the location of the bottom of the hair band and mark it with a pin. Check to see that your marked spot is centered and adjust if necessary. Take matching yarn and your yarn needle, attach the button to this location using the same method above. Cut a piece of wire that measures, at least 20-22 inches long. Bow the wire so it forms a semi-circle then, bend the wire about 3 inches from one end at a right angle. Thread your handle beads onto the wire from the other end, leaving another 3 inches on that end without beads. Bend the wire at 3 inches from the end, again at a right angle. Now, add some of your ¼ inch plain beads onto the remaining ends of the wire until there is only about ½ inch of wire left on the end. Using your needle nose pliers again, twist the last ½ inch of wire into a loop that will keep the beads securely on the wire. To attach the purse handle you will need to thread your yarn needle with the same color of yarn you used for joining the purse pieces together. Be sure to use a piece of yarn almost 5 times the width of the purse so that you will not run out of yarn before you complete the attachment. Follow the diagram given below to stitch the handle onto the back of the purse. Start at the square labeled 1d and send your needle and yarn down that square hole. Leave about 2 inches of the yarn end. Then, stitch up through the square hole labeled 1u. Tie the threaded yarn with the 2 inch end in a secure knot over the handle assembly allowing the yarn to tighten down between the small beads to the wire. Trim the end and continue to follow the diagram by going down again at the hole marked 2d. Continue along the diagram following the number sequence doing down first, then up. Be sure to allow the yarn to tighten in between the small beads of the handle assembly whenever it is crossed. When you reach the other side, at 16d and 16u, finish off the end of the yarn with a secure knot and trim off excess yarn. Cut your felt so you have 2 pieces that measure 11 inches wide and 8 inches tall. Using a ½ inch seam allowance, stitch both 8 inch sides (sides) and one of the 11 inch sides (bottom). Trim seam allowance close to stitching. At one of the corners, press the side seam against the bottom seam to form a triangle with the corner as the top of the triangle and a a base of 2 ½ inches across. Do the same to the other side of the lining. Trim the triangles off close to the stitching. Put the lining into the purse and adjust so that the bottom, sides and corners are against the purse and the top edge lines up with the top edge of the purse. Thread your needle with the thread color to match the color of your lining and knot the end. Stitch the lining to the purse body just under the top edge stitching* of the purse around the sides and front. (*between the end of the up and down pattern on the purse, and the top edge stitching of the purse). Each stitch should catch at least one line of the plastic canvas on the outside and be sure to catch the felt on the inside. To stitch the lining to the purse along the back side of the purse, catch the plastic canvas on the outside between each of the up or down stitching rows. Inside the purse, extend each stitch to the next up or down stitching row. Stitch the lining for the top flap last and stitch around the sides and front just as you did for the sides and front of the body lining, between the pattern and the edge stitching over at least one line of plastic canvas on the outside, and being sure to catch the felt on the inside. The top flap lining piece will extend down into the purse body and cover the handle assembly. Stitch the top flap lining to the back of the purse body in the same way you stitched the body lining onto the back of the purse, between each of the up or down stitching rows on the outside and extending to the next up or down stitching row on the inside. Great for the little girl or adjust the colors and design for an adult. *This version includes all 6 purse cover patterns in additional to all instructions.